A WEEK BY PLAYING TABLE GAMES! If you love table games, there’s no better place to play than at BitStarz! 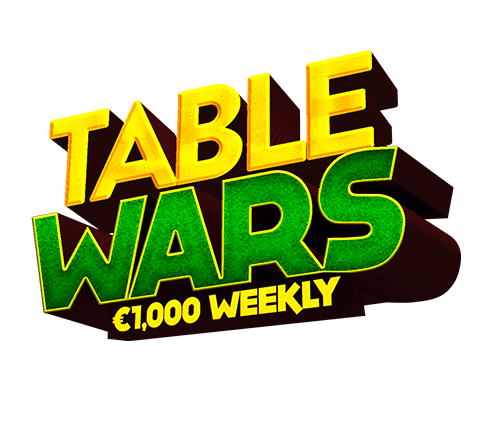 Table Wars is an exciting promotion that is very similar to our beloved promotion Slot Wars, but with table games. All you gotta do to participate here is to play any table game in the casino, and you will climb our real-time updated leaderboard while doing so. The promotion lasts for a week at the time, where the top 20 players get a share of A €1,000 prize pool, with the first prize being an incredible €500 cash, without wagering requirement what so ever! So if you love table games, there’s no better place to play, than right now at BitStarz! 1. Wagering on slot games do not count towards the promotion, only table games.Wagering amounts will be turned into points and shown on this page. 1a. Only players who have made at least 4 deposits are able to participate in the promotion. 2. A new race will start every 7 days (Running from Monday - Monday) with a new €1,000 prize pool. Starting time of the promotion is at 10:00 CEST and ends 7 days later at 09:59 CEST. 3. Players will be paid the currency equivalent in the currency used on their account of the prize displayed in euro. 4. The winners will be officially declared by the end of the period and the prizes will be paid out within 1 hour. 5. Prizes come without wagering requirement. 6. Accounts which are closed at the time when promotion ends will not be paid. 7. You can easily keep track of the promotional period by checking the timer on the Page. 8. We will be sending updates about this promotion by email. Stay tuned and make sure you have enabled the option to receive 'our promotions' in your profile. 9. Kindly note that the range of games available to you may change depending on your geo location and game availability. 10. Minimal Risk Wagering is not allowed, which includes (but is not limited to) playing red and black at the same time on Roulette. If a player uses minimal risk wagering to boost their turnover in the tournament, the player in question will be disqualified at the end of the promotional period and will not receive a prize in the promotion, regardless of what’s stated on the leaderboard. 11. BitStarz General Terms and Conditions apply.